Com. 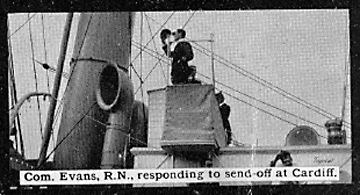 Evans, R.N., responding to send-off at Cardiff..
Recto: A black and white photograph within a black border showing Com. Evans on platform near the funnel of the Terra Nova. The caption reads: Com. Evans, R.N., responding to send-off at Cardiff.